Joselyn is 3 yrs and is a lively fun loving daughter. She has an incredible spirit that has led her to learn virtual anything. She has been in therapy since she was 6 mths old. 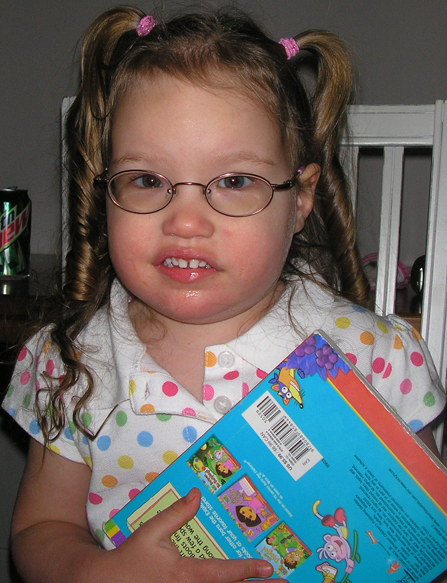 She was diagnosed w/ developmental delay when we lived in Kansas City. She has since moved back to Toledo and is seeing all kinds of specialists, whom have run just about every test they know of on her. She passes them all. She is our little medical mystery. In PT and OT she has had to learn how to roll over, sit up, stand,crawl, walk, eat and most recently sign. She does not talk but she does babble. She has been diagnosed w/ Hypotonia and Severe Speech Apraxia. Instincts that most children are born w/ my daughter has had to learn. We have conquered most of them w/ the exception of speech and her ability to control and express herself in some other form then signing or throwing a tantrum. It is heartbreaking having a daughter who is so good, so smart and so cute yet she is trapped in a body unable to communicate w/ those she loves. Joselyn has not been diagnosed w/ Autism yet. However she shares a lot characteristics w/ a highly social form of autistic children. She is going to the Ann Arbor Autism clinic on September 18th to see Dr Solomon, in hopes he can help answer some of our questions. We appreciate you finding it in your heart to donate to our cause. Jo has lots of friends w/ whom this label “Autism” captures and she loves them no differently than her typical friends. No matter what the outcome of Jo’s testing this cause will always be close to our heart. Thanks for being our friend and getting behind something that we feel so strongly about. Lots of love and hugs to you. We promise to pay it forward when given the opportunity. God bless you all!